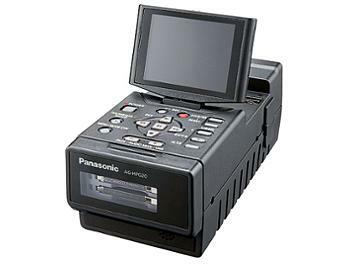 The AG-HPG20 is a P2 portable recorder that records HD images with an AVC-Intra codec. It features a rugged body, two P2 card slots, a 3.5" LCD monitor and HD/SD multi-format recording. Its HD/SD SDI interface enables versatile line recording, and a USB 2.0 interface makes it easy to backup data onto an external hard-disk drive. A new HDD Preview function also lets you preview P2 content stored on a hard-disk drive. These and other features allow the AG-HPG20 to handle a wide range of applications, including HD field recording; high-quality, large-screen playback, and easy file transfers to a hard-disk drive or PC-based nonlinear editor. *Not available AVC-Intra 100/50 recording via IEEE 1394. *Pull-down playback for native-mode recorded source.